We love our dogs, and in a perfect world, we’d spend every waking moment with them. But knowing that our dogs are comfy and cozy while we are away grants us peace of mind. The perfect little bed, a bowl full of their favorite chow, a basket overflowing of toys…but what else can we do to make things just right in our absence? Think about it: what is the most soothing sound to your dog’s ears? A human’s voice! This is why Audible has gone to the dogs–giving your dog an opportunity to rely on a human’s voice while dog moms and dads are off at work, running errands, or at places were Fido can’t tag along. This ingenious idea to keep our pups at peace while we’re away came as a result of an independent academic study in 2015, which discovered that audiobooks outperformed music when it came to reducing anxiety and stress in canine participants. Audible then decided to dig deeper into this interesting revelation, conducting a study on 100 lucky dog participants in partnership with Cesar Millan’s Dog Psychology Center in Santa Clarita, California. What did they find? Well, 76% of those dogs tested showed a noticeable increase in calm and relaxed behavior when listening to audiobooks. Who knew that something so simple as a human’s voice while you’re away could keep dogs mellow and at ease? Thus Audible for Dogs was formed to give dog parents like you a chance to keep your pup happy when you can’t be near. A calm, soothing voice to keep your dog’s mind relaxed in your absence. Who knew something so simple could make such a positive impact on your dog’s mental state? As many dog owners–especially those rescue dog owners–know, dogs who deal with anxiety when their human is away go through a lot. When they are mentally stressed in their human’s absence, they can find themselves in trouble or act out to help ease their worries. And then there are those breeds that are naturally prone to separation anxiety… which can make for a fretful combo when you combine the two. 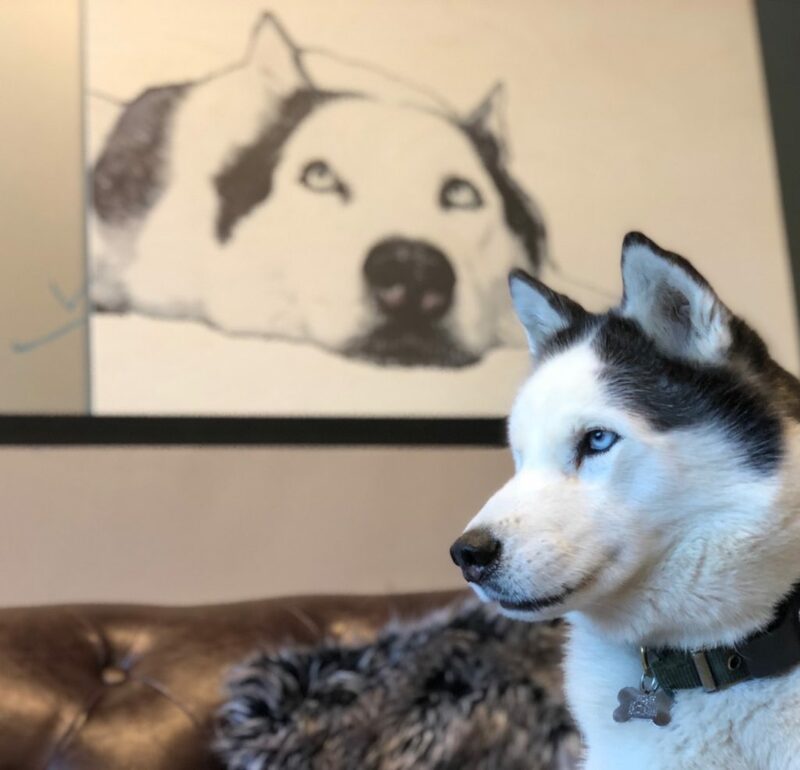 Splash, CEO of iHeartDogs, is a senior husky who once lived a life on the streets before she got lucky with her human family. For her, Audible has been a dream come true. Now she can hear a human’s voice when her family is away, to help keep her mind calm… so she won’t resort to those naughty dog behaviors as a means to cope with her separation anxiety. Are you ready to see for yourself what other dog owners are now swearing by? Audible for Dogs promises you a free 30 day trial so that you and your dog can test it out. Sign-up is easy, and you even get two free books to start! That’s one book for you, and one book for your dog. And because we care about all dogs, for every single sign-up our iHeartDogs fans complete, we will donate 10 meals to hungry shelter pups waiting to find their forever families. Now, that’s music to a human’s ears.